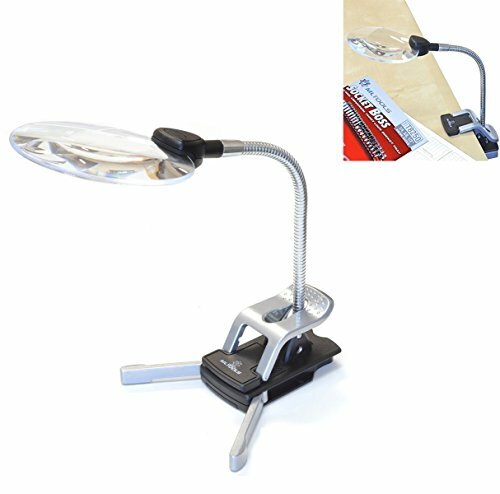 ML Tools Tabletop clip-on/stand magnifier is compact, elegant and easy to use. It offers a crystal clear 2x magnified image and a built-in inset magnifying len for 5x magnified images. It is not only great for serious hobbyist and readers but also a great handy tool for people with low vision reading everyday items. Great uses include reading, soldering, jewelry making, works on computer boards and mini model building, etc. Two LED lights simply make your jobs easier than ever. This magnifier also comes with 2 swing-out stabilizers for greater stability The two 8"-long bonus goose-neck tubes can hold light objects and work great as a third hand. (Note: please refer to user manual for installation instructions). The tabletop clip can grasp onto any horizontal surface up to 1-1/2 inches, even at a slight incline. It uses 3 AAA batteries (not included). Battery holder is located on the bottom of the base and the LED light switch is located on the back of the base. ★ Uses 3 AAA batteries (not included).
? 100% customer satisfaction guaranteed!